NAPOLI SAY RUMOURS they are signing Edinson Cavani and Angel Di Maria from Paris Saint-Germain are “fake news”, with the club president decrying the “lies” of newspapers in a radio interview. Cavani played for the Serie A side between 2010 and 2013, the Uruguay international since becoming PSG’s record goalscorer. But with the Ligue 1 champions reportedly keen to raise funds, Cavani and Di Maria have both been linked with moves away, although Neymar has insisted he is staying in the French capital. Napoli, though, sought to distance themselves from the PSG duo on social media, using the hashtag #StopFakeNews to deny reports about the attacking duo. President Aurelio De Laurentiis also hit out at rumours Napoli could seek to bring Cavani back to the club after a five-year absence, repeating past comments about the striker’s salary as well as decrying links with Real Madrid striker Karim Benzema. We can’t take all the newspapers because there are so many lies,” De Laurentiis said to Radio Kiss Kiss. “Di Maria and Benzema? Very much false. “I’m very surprised because the Corriere dello Sport editor is experienced and I only wish good things for him. Is Antonio Giordano the only one I can trust to tell the truth? “There’s an agreement between myself and [coach Carlo] Ancelotti. Why would I sign these two old men, with all due respect? I don’t have to please the fans, they play football in the bar, I respect them but they need to stay calm and let us work. “The possibility of Benzema is not remote, it’s very remote. Cavani? He earns €20 million gross every two months. He’s brilliant, but I don’t think he’ll halve his salary. 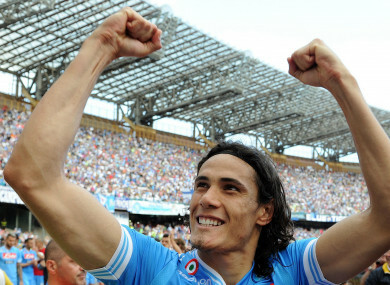 If Cavani were to call me and tell me he’s OK to cut his salary in half and fit the Napoli wage structure, great. De Laurentiis rejected further media speculation surrounding Ancelotti and Monaco striker Radamel Falcao as the new Serie A season nears. “Falcao? False! He doesn’t score anymore, it’s fake news,” the Napoli president added. “Di Maria done? Absolute nonsense! False, very much false. De Laurentiis suggested earlier this month Juventus’ new signing Cristiano Ronaldo was offered to Napoli before joining the Serie A champions in a €112m switch from Real Madrid. Email “'What kind of idiot goes to Paris by helicopter?' - Napoli president slams Cavani rumours”. Feedback on “'What kind of idiot goes to Paris by helicopter?' - Napoli president slams Cavani rumours”.